Why Have a National Nurse for Public Health? Seeking legislative support for a National Nurse for Public Health provides opportunity to be reminded and review how such a position would enhance prevention efforts at the local level. The National Nurse will encourage nurses everywhere to become more involved in health promotion within their own communities. The possibilities for nurses to lead and support local preventive activities are numerous. This local leadership approach will offer the advantage of allowing nurses, functioning as individuals or in collaborative partnerships, to "customize" their community approaches to specifically target disparities. Nurses are highly trusted by the populations they serve. Their knowledge and skills allow them to assess need, identify gaps, plan, implement and evaluate tailored interventions based on their own community's priority challenges. Guidance and coordination offered to nurses from national leadership of a National Nurse will be a valuable resource, yet still allow for local influences that will yield approaches that are specific to each community. Some nurses may choose to work with established outreach programs integrated through schools, faith-based facilities or community based organizations. Others may opt to introduce new programs not previously offered locally, approaches showing strong evidence of effectiveness in other communities with similar needs. Student nurses and retirees in significant numbers can are a tremendous resource for annual community wellness events and mass immunization efforts. Nursing students from Portland Community College demonstrated their value at a recent immunization clinic held in Multnomah County (Portland, Oregon). More politically active nurses can become involved in leadership at the systems level and influence the stakeholders and gatekeepers in their community to support local prevention efforts. Having a National Nurse for Public Health will be a significant nod to nurses everywhere, acknowledging their contributions and their value in society. More importantly, it is but a first step to organizing the collective power of nurses everywhere to make greater contributions to the well being of our nation. 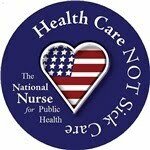 Nurses rallying to support the initiative for a National Nurse know it is time to begin the process.